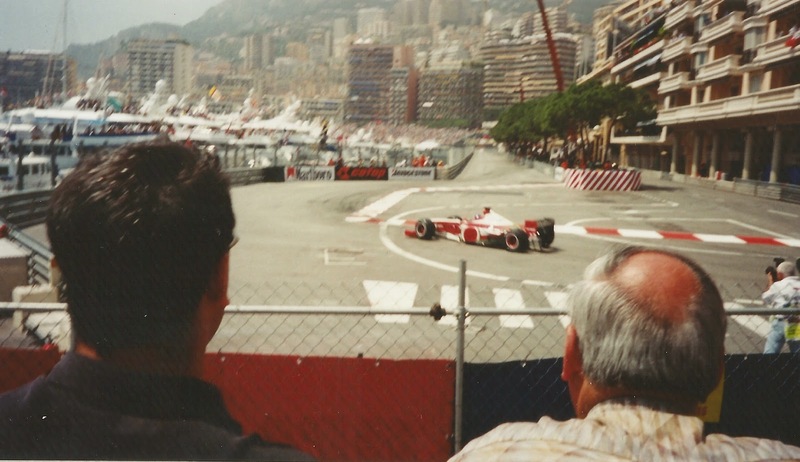 In 1999 I had the opportunity to travel to Monaco with a bunch of mates to watch the F1. Of course I didn't need asking twice. We'd all left University a few years earlier and this was a chance to catch up and go and watch my favourite sport at my favourite track. We would be staying in the south of France for a week and driving down in two VW Sharans. There were 14 of us in total but only a handful went to watch the Grand Prix. Those of us who were going to the race debated long and hard about which grandstands tickets to buy for the race and qualifying. Ultimately the entire trip was being done on the cheap (we were staying in a friend of a friend's apartment a few miles down the road) so budget was key. We decided to watch qualifying from the grandstand at Nouvelle Chicane and the race from the old grandstand at Beau Rivage - the cheapest race day tickets available. The journey through France took an entire day. Calais to Monaco is 800 miles and takes 11 hours. It certainly felt it. Especially as the two rear seats in a Sharan are tiny and we all had to take a turn in them. We stayed in our apartment for a few days and sampled the local area, then on the Saturday drove to Monaco itself for qualifying. We had to park a couple of miles out of Monte Carlo - in fact we probably parked in France. The roads were lined with cars from the mountains down to the city. We descended into Monaco in blazing sunshine. It was a strange experience. 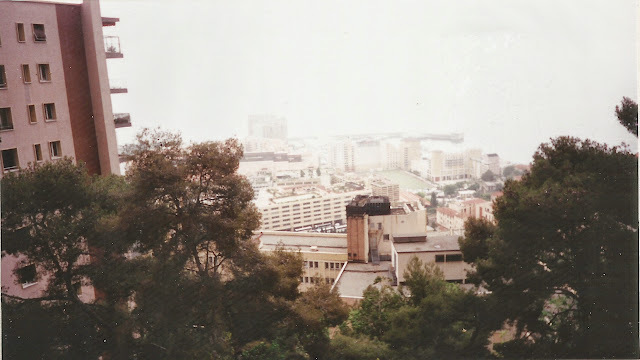 I was so excited at actually seeing Monaco in the flesh, yet couldn't actually see any of the recognisable bits until we were almost in the centre. The route in and outskirts are just like any other city - pretty dirty, full of concrete and a maze of roads and alleyways. Our grandstand could only be reached by the taxi across the harbour so we headed for Rascasse. We had no idea where we were most of the time (the police were no help) and basically headed downhill until we reached the city centre then turned right and followed our noses to the harbour. Standing on the harbourside at Rascasse was the fulfilment of a long held ambition. I'd seen the race on TV every year since 1994 and had seen F1 at Silverstone a few times but this, this was Monaco - the jewel in the crown of F1. The buildings, the yachts, the track and the cars. It was all there in glorious technicolour (unlike my photos which were scanned from an old file I found). We took our taxi across the harbour and settled into our seats on the very top row of the grandstand. Behind us was the tunnel exit, in front we could see the chicane down to Tabac, with the swimming pool in the mid-distance. A brilliant view. And then qualifying started. I knew F1 cars were loud but with the Monte Carlo buildings and cliffs as acoustic reflectors every single sound the 800bhp, 3 litre, V10s made was magnified tenfold. At flat, windy old Silverstone the noise comes and goes with the wind but at Monaco it goes BANG BANG BANG against the walls and right at you. Plus, the cars coming out of the tunnel carried their sound - pulling it out with them and showering you with glorious downchange and engine violence. Monaco also presents F1 cars up-close. No gravel traps and grassed areas. You are trackside and they are in your face. Red Ferraris, yellow Jordans, silver McLarens, blue Saubers and Benettons, white BARs and Stewarts, black Minardis and orange Arrows. An awesome visual and aural feast. We cheered when Hakkinen took pole, Coulthard took 3rd and Irvine took 4th. We were saddened to see Damon Hill off the pace, then hit the barrier at Tabac - he qualified a miserable 19th in the Jordan. And then it was over. We took our water taxi back and walked back to the car. 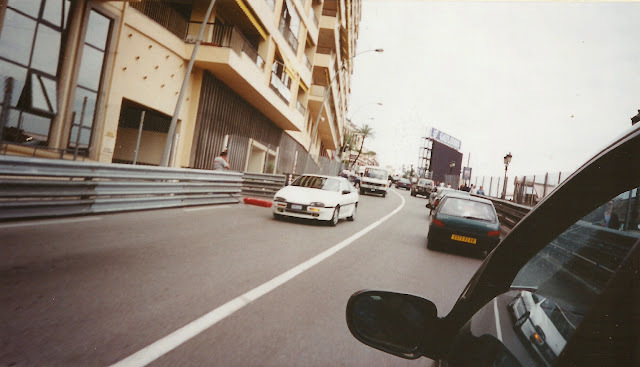 Then, we drove (very slowly) into Monaco in heavy traffic and completed a lap of the circuit. The next day the sun was blazing even more fiercely. 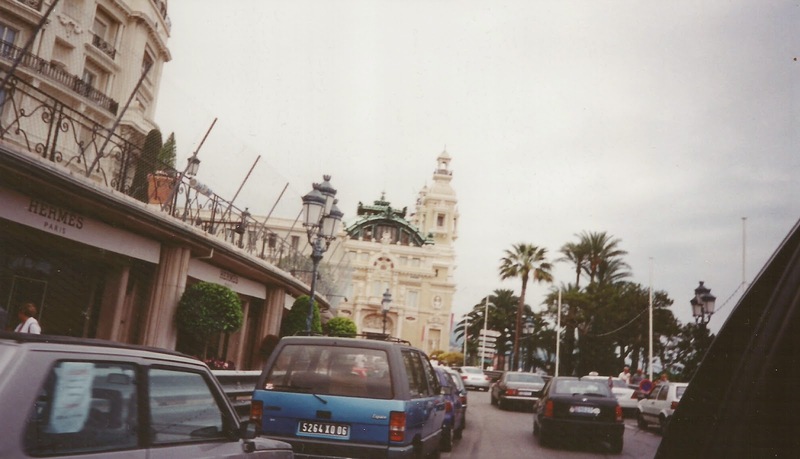 We took the train into Monaco, knowing the traffic would be hell. This was a good idea as the station drops you right in town. Our seats were just after the first corner at Beau Rivage and getting there was an absolute nightmare. We had no idea where we were going, the crowds were humungous and moving in every direction at once and half the roads were closed. We had given ourselves 2 hours to get our seats from the train dropping us off but we got there just 10 minutes before the race, dripping with sweat. Our route had taken us up into the hills and back down again. The distant view was epic - we could see a lot of the track, but could only see 50 or so yards worth of the circuit in front of us. The huge diamond screen in front of us, but on the other side of the track, was facing the other way too. These really were the cheap seats. The race started somewhere in the distance (we could hear it but not see it) and within seconds the field swarmed past us. This time they were even louder because we were literally yards from the track. It was one of those turn to your friend and say "Oh My God" moments. Several cars crashed up at the Casino Square and the drivers had to walk past us to get to the pits. I seem to remember Jean Alesi and Johnny Herbert walking past and waving up to us. The field spread out quite quickly. There were many accidents, although none in front of us. By the halfway point there were only 13 cars running, and only 8 finished. Can you imagine that in modern day F1? The race had been awesome. We were sunburned to hell. Our ears were ringing. Our grins were wide. It had been good. The result was only OK - Damon Hill had retired on lap 3 and Schumacher won. I've never been a fan of Schumi. Irvine and Hakkinen finished on the podium, which was good, and Alex Zanardi brought his Williams home in 8th place. We spent another couple of hours in Monaco. We walked the track, picked up tyre marbles, inspected the prat perches in the pitlane and inspected the debris. We swarmed with the rest of the crowds from place to place. We bought ham sandwiches for 80 Francs each. The train journey back to our apartment was not good. In fact it was dreadful. The train company had put on old rolling stock for the race and we were crushed into these ancient, double decker carriages in 40°C heat with armpits and elbows in close proximity. The next day we drove back to the UK. We averaged 100mph in the Sharan 1.9TDi but were stopped by French police 200 miles short of Calais. They ordered us to pay 2000 Francs (£200) in cash there and then. We said we didn't have that so they told us they'd drive us to a cash point. We noticed they had sidearms and found the cash pretty quickly. 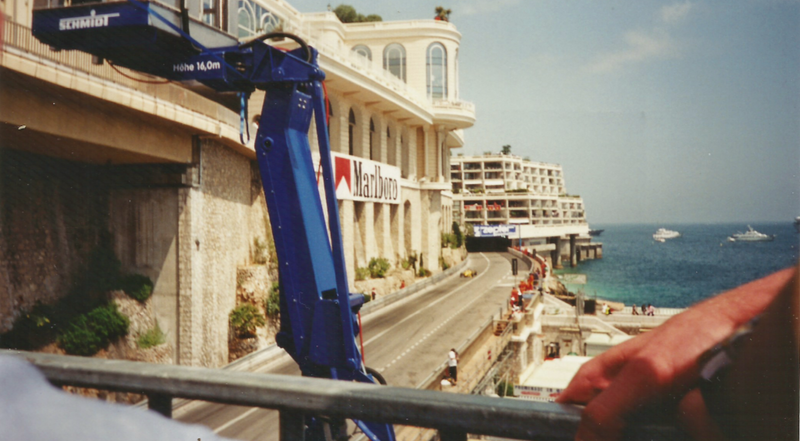 My Monaco trip took place 14 years ago but I still remember most of it like it was yesterday. I'll go again some day. You should too. It is a very special, and unique experience. Apologies for the poor photos. I lost most of those I took and scanned these from an old file.